I love it when someone tells me about a person or a brand doing something that is unusual. Typically it’s someone who didn’t set out to become ‘Instafamous’ or whatever, but someone just creating something that resonates with people. I mean, come on, I’m so bored of marketing people talking to people about how they should do marketing, aren’t you? (Don’t close this post just yet ????). I’m just putting this video here as a reminder of the thing I hate the most – and to get maximum use out of the creation of the video. Teresa Heath-Wareing signposted me to the Instagram sensation that is Mrs Hinch. Now, whilst I like a clean and tidy home (basically impossible to achieve with three children), Mrs Hinch is next level. I can’t explain it as I don’t truly understand why anyone needs to throw half a bottle of Harpic pine (note how I know the precise brand and product) down the toilet before they go out. But the fact that Mrs Hinch has 1.4m followers at the time of publication tells us a few interesting things about the world of social media, marketing and society as a whole. The vast majority of content is created on Instagram stories. The platform is not important, but the format is. Stories allows Mrs Hinch to tell you what’s happening in her life: what she’s cleaning, what’s on offer in Home Bargains, how Henry the dog is behaving. It’s a first-person narrative – you hardly ever see her face, you see the world through her eyes. Does it resonate with people because they wish their world was like this/their home was this clean? Whilst not instructional, Mrs Hinch guides you through her decision-making processes – why she likes a particular product, what she does with it. She shows you the results. The home at the centre of the story is not large or grand. Mrs Hinch’s profile image is of the home – a modest 2-3 bedroom house that’s been decorated stylishly but, importantly, not at any great expense (I’m assuming this from the amount of stuff bought from shops like The Range, Home Bargains, Wilko’s) aka ‘bargs’. Anyone can buy the products she uses and anyone can make their home like hers – and clearly some do, see later point. The language she uses is matey ‘ATB’, you feel like you know her. They’re called ‘Hinchers’. Clearly they are loving her content and how she’s doing what she does. Hinchers buy the products she uses, use the nicknames she uses, even replicate her style. They stand at the disinfectant aisle in the supermarket and use secret language to acknowledge each other whilst they stare at Zoflora – when you know, you know. This tribe’s willingness to buy products that Mrs Hinch uses has meant that you can’t buy the ‘Minkeh’, a sponge she uses to incessantly wipe surfaces, and dress. This is the true power of influencer marketing, a direct impact on the bottom line. Zoflora, the Huddersfield based manufacturer of all things that rid your home of bacteria and viruses has had to double production of its products to keep up with demand. Although Mrs Hinch may look like a tonne of Instagram influencers, her content is far removed from the perfectly crafted post that goes on a grid. 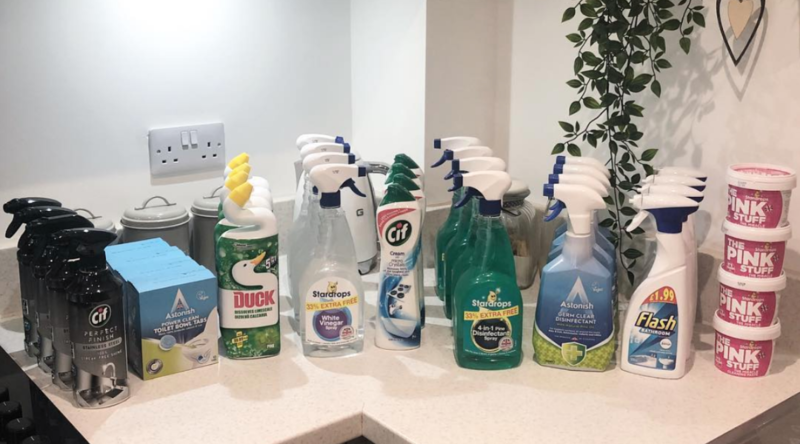 Whilst we don’t all have our own name on a bottle of Fairy Liquid, the struggle of keeping a house clean is real and the satisfaction of the end result does bring genuine joy. Her lack of pretentiousness means that the audience is on the journey with her and supports her, indeed is happy for all the exciting things that are happening to her. You’ll see things that go wrong, you’ll see things put right, you’ll feel like you’ve basically cleaned it yourself. The age of the overpaid influencer is dead. Long live Mrs Hinch. If you’re looking into enhancing your social media presence and trying to catch up to Mrs Hinch, our services can help!